Presented in RCRDs Workshop in Bhaktapur. By Meenraj Panthee Accessing Persons with Disabilities in Livelihood Program and Social Security in Nepal. 1 Presented in RCRDs Workshop in Bhaktapur. By Meenraj Panthee Accessing Persons with Disabilities in Livelihood Program and Social Security in Nepal. 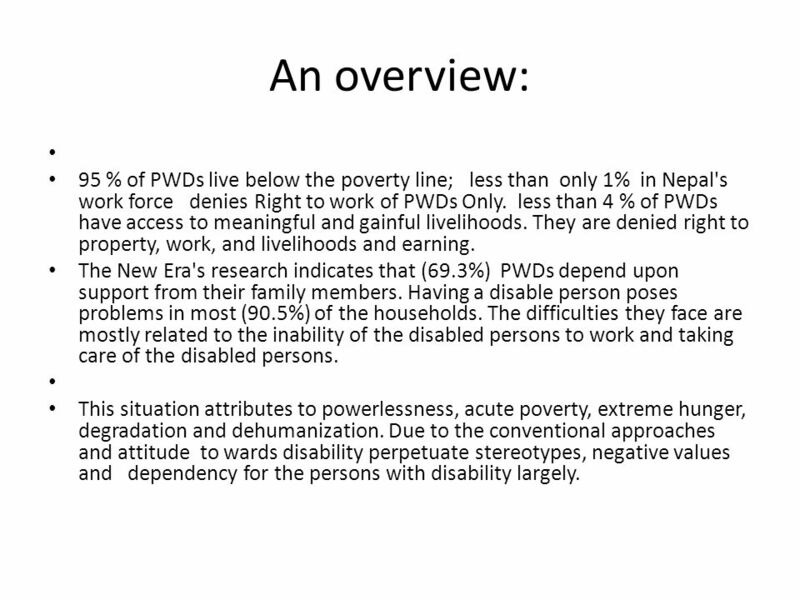 2 An overview: 95 % of PWDs live below the poverty line; less than only 1% in Nepal's work force denies Right to work of PWDs Only. 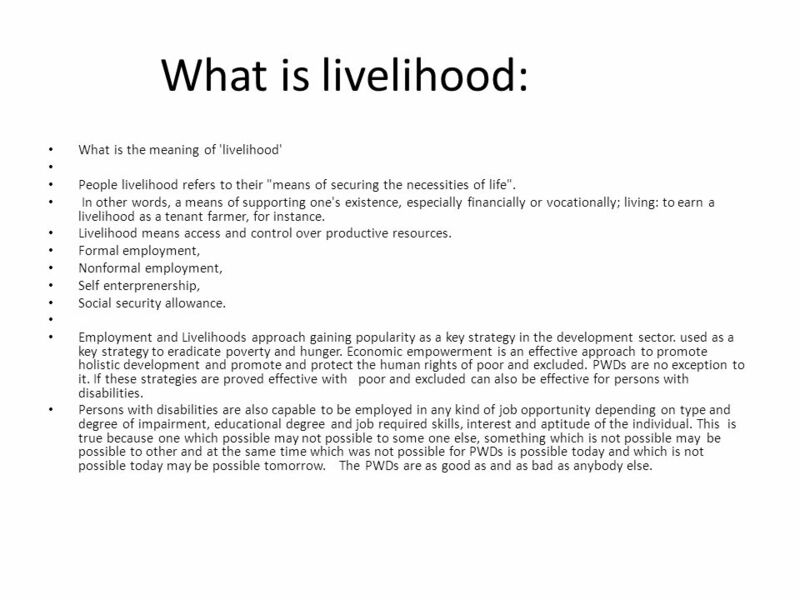 less than 4 % of PWDs have access to meaningful and gainful livelihoods. They are denied right to property, work, and livelihoods and earning. The New Era's research indicates that (69.3%) PWDs depend upon support from their family members. 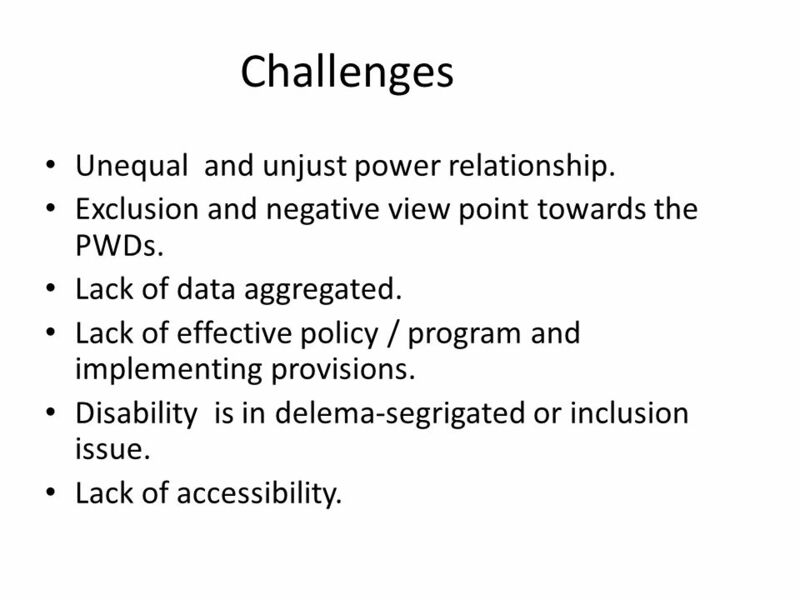 Having a disable person poses problems in most (90.5%) of the households. The difficulties they face are mostly related to the inability of the disabled persons to work and taking care of the disabled persons. This situation attributes to powerlessness, acute poverty, extreme hunger, degradation and dehumanization. Due to the conventional approaches and attitude to wards disability perpetuate stereotypes, negative values and dependency for the persons with disability largely. 5 policies 5 percent quota reservation on civil servant act. DPWA provision: Provisions for training and employment: list of 4 items 1. appropriate trainings and employment for making the disabled persons economically independent. 2. Arrangements may be made engage the disabled persons, by way of labor supply system, in labor of employment scheme such as open and self-help industry or rural employment. 3. disabled labors with additional facilities needed at least for the maintaining of normal livelihood. 4. A factory which appoints more than 25 labors may be so required that it should appoint the disabled persons in a number not less than five person of the total number of the labors to the appropriate works, to the extent available, on the basis of their physical capability, training, qualifications and experience. Such labor shall receive such remunerations as is equal to that payable to other labors. Their terms of service and career development opportunities shall also be the same as are of the labors. 5. Arrangements may be made to provide basic facilities, availability of raw materials, loans, market management etc. protection, so as to operate cottage and rural small-scale industry for providing private employment to the disabled persons only. 6. Arrangements shall be made to do study or cause to be done study as to employment and ways and mean of livelihood for the disabled person, only and the feasibility of the facilities and concessions that may be granted and ought to be granted thereto. 7. Arrangements may be made to require the use of such security equipment as is to secure a disabled person while engaging him in work with equipment. 6 Affirmative policy and practice to some extent. Employment reservation in civil service, teacher quotas. Budget allocated in VDCs and DDCS. Disability allowance for severe PWDs. 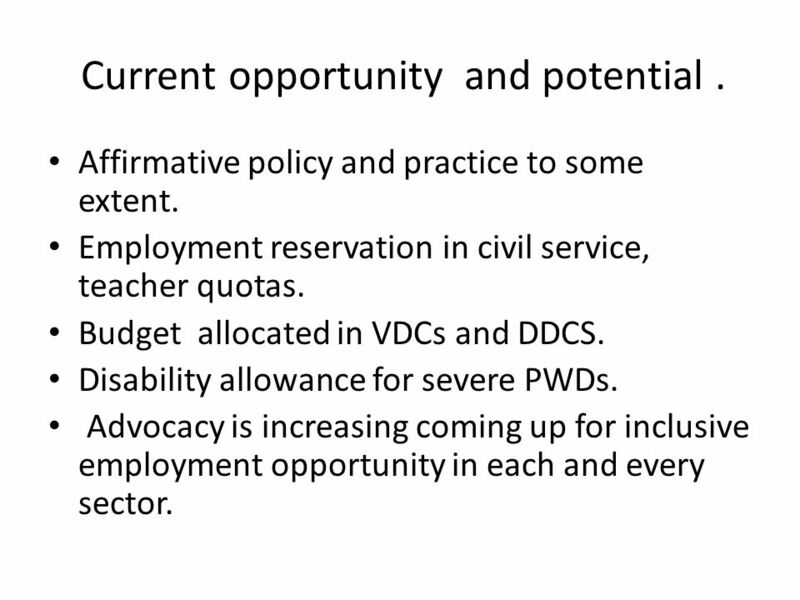 Advocacy is increasing coming up for inclusive employment opportunity in each and every sector. Current opportunity and potential. 7 The educated/skillful PWDs significantly coming up in the market. 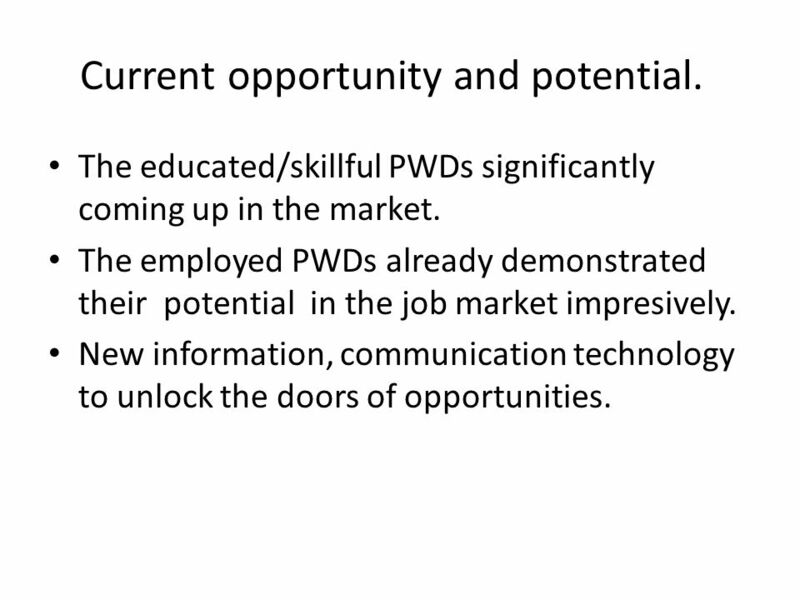 The employed PWDs already demonstrated their potential in the job market impresively. New information, communication technology to unlock the doors of opportunities. 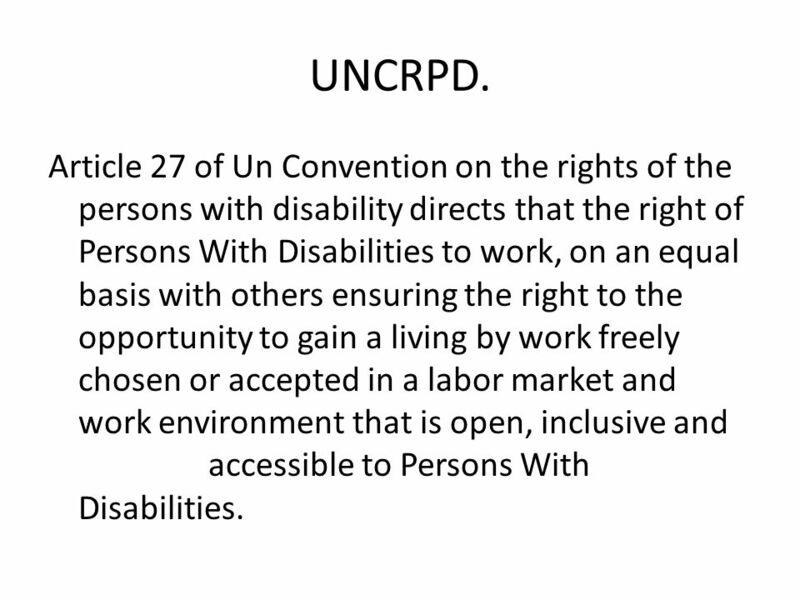 11 Article 27 of Un Convention on the rights of the persons with disability directs that the right of Persons With Disabilities to work, on an equal basis with others ensuring the right to the opportunity to gain a living by work freely chosen or accepted in a labor market and work environment that is open, inclusive and accessible to Persons With Disabilities. UNCRPD. 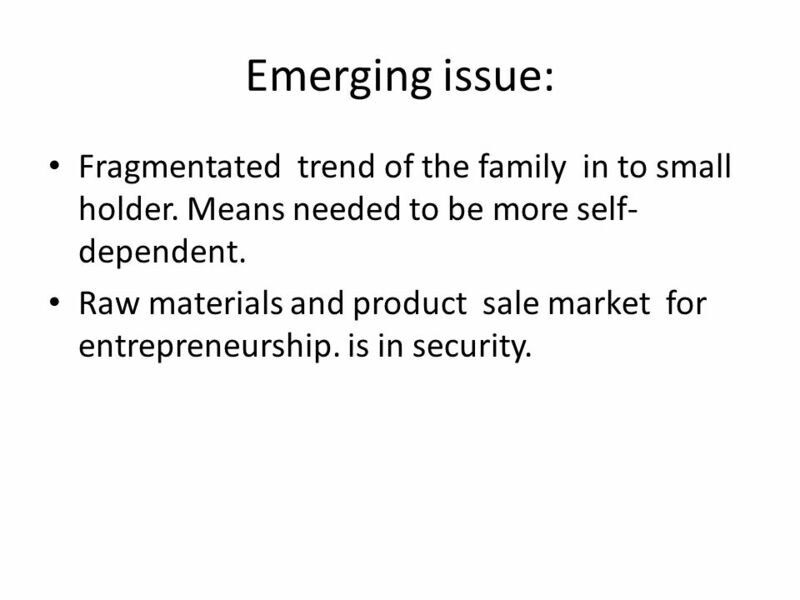 12 Emerging issue: Fragmentated trend of the family in to small holder. Means needed to be more self- dependent. Raw materials and product sale market for entrepreneurship. is in security. 13 Strong advocacy for a meaningful and gainful livelihood opportunity. 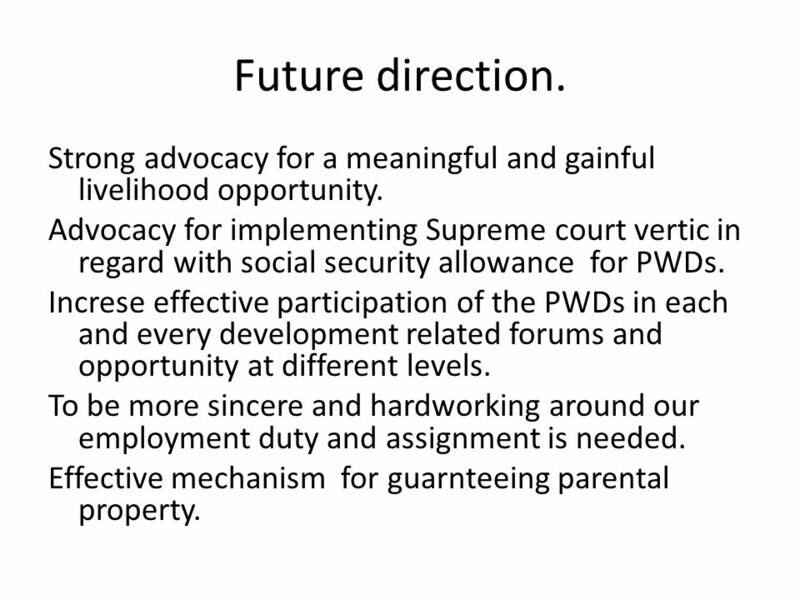 Advocacy for implementing Supreme court vertic in regard with social security allowance for PWDs. Increse effective participation of the PWDs in each and every development related forums and opportunity at different levels. To be more sincere and hardworking around our employment duty and assignment is needed. Effective mechanism for guarnteeing parental property. Future direction. 14 Organizing carrier expo for the PWDs and such related forum synergize the livelihood campaign. Focus for inclusive livelihood approach. 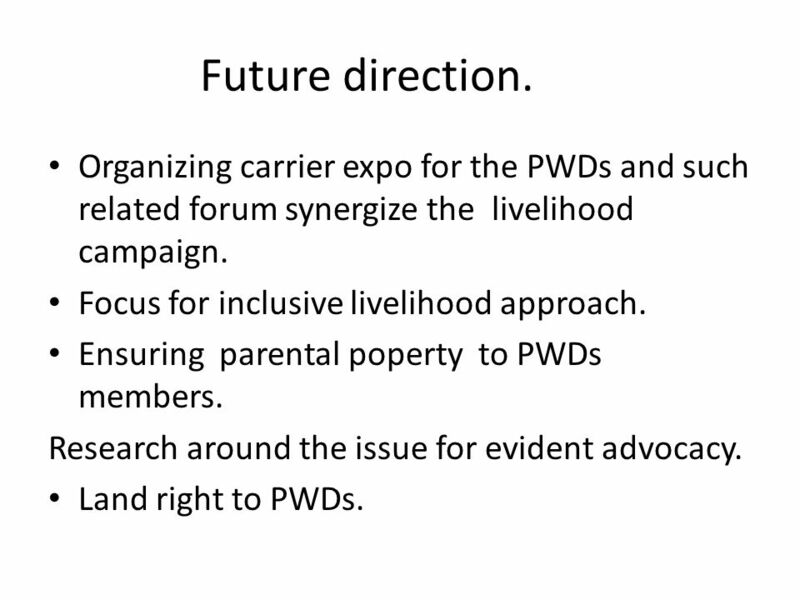 Ensuring parental poperty to PWDs members. Research around the issue for evident advocacy. Land right to PWDs. Future direction. Download ppt "Presented in RCRDs Workshop in Bhaktapur. 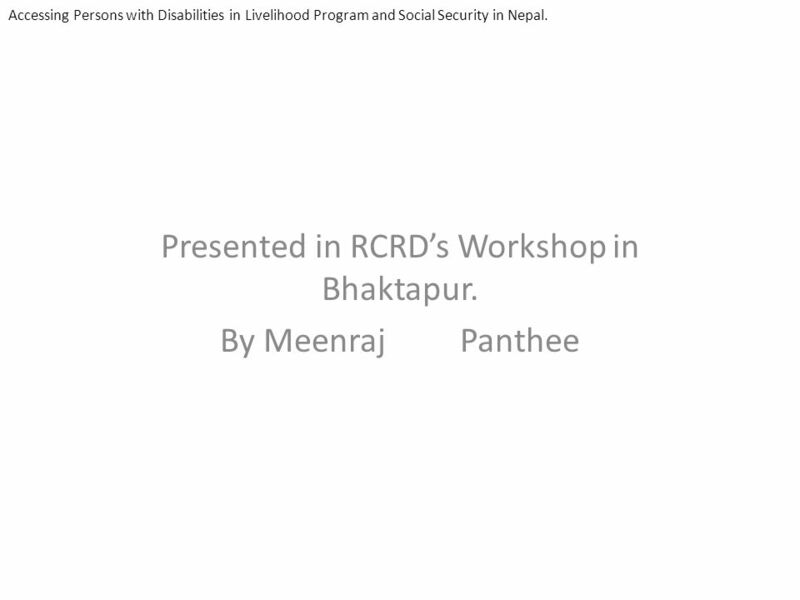 By Meenraj Panthee Accessing Persons with Disabilities in Livelihood Program and Social Security in Nepal." Youth Employment and Urban Renewal UN-HABITAT Discussion paper for Expert Group meeting. LEARNING ENVIRONMENT FOR DISABLED USERS (L.E.D.) Research Index National Study: Northern Ireland March 2012. Seventh Framework The People Programme DREAM PROJECT Toward Economic Independence Towards Effective Employment Policies for Persons with Disabilities Betul. “Understanding the UNCRPD and making the rights a reality” Heather Logan Disability Action’s Centre on Human Rights for People with Disabilities. TVET Initiatives & Quality Assurance in Fiji Presentation at IVETA Conference, Las Vegas December Dr. Isimeli Tagicakiverata Pacific Association. Disability, Education and Employment in Developing Countries: from charity to Investment Kamal Lamichhane, Ph. D. Research fellow Research institute, Japan. Khaled Alloush UN Resident Coordinator UNDP Resident Representative Speech To Dubai International Rehabilitation Forum REHAB 2008 “UN Experience” 10 March. BRIEFING ON THE SADC PROTOCOL on Gender and Development By Emilia Muchawa. YASIN JANJUA CENTRE FOR POVERTY REDUCTION AND SOCIAL POLICY DEVELOPMENT (CPRSPD) Youth Engagement Strategy (YES) Issues, Challenges and Opportunities. Capacity Building of Organizations working with Children with Disabilities Yetnebersh Nigussie Acting Executive Director, Ethiopian Center for Disability. Discrimination on the basis of disability Module 5. Survey results of learners from Bulgaria. Disability Employment is a national priority calling special political and public attention and requiring the. ACAP PROJECT Awareness Raising to Project Partners in Self Savings and Credit on Inclusion of People with Disabilities ACAP PROJECT Awareness Raising to. Ann Morton Hyde ENAR Conference Budapest The Situation of Roma in the Employment Sector. FIFTH ANNIVERSARY OF THE INTERNATIONAL CONVENTION ON PERSONS WITH DISABILITIES, Madrid, 6/7 th May, 2013 Participation of children with disabilities, Gerison.